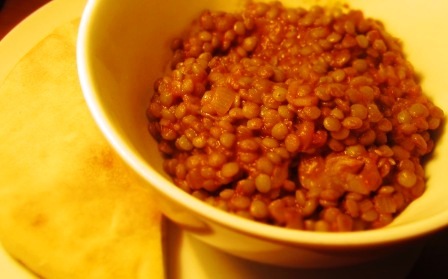 Ever found that you have a packets of lentils in your pantry and don’t know what to do with it? 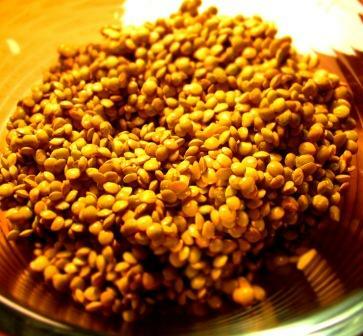 Lentils are inexpensive, high in protein and very versatile. Apart from just using it in soups, it also makes a brilliant stew. Heat up the oil and fry the onion, garlic and ginger until translucent. Add the rinsed lentils, spices and the chicken stock and bring to the boil. Once it started boiling, turn down the heat and allow to simmer for 20 minutes. Stirring often; also try to skim off any scum that forms on the surface. 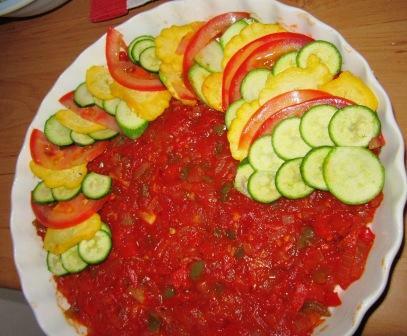 Stir in the tomato paste and allow the cook until the desired texture is acquired. I prefer mine, thick and tender with the lentils still maintaining their shape. I’ve found that the stew went very well with a lightly oaked Chardonnay. The meat has already been defrosted, so what to do with this beautiful cut of meat on a school night? Make a quick and easy lamb pot-roast of course! Rub the lamb with the olive oil, the chopped garlic, lemon juice, cumin and salt and pepper. Heat an oven proof casserole and sear the lamb on all sides. Add the stock and chopped onions, add the spices, sugar and tomato paste. Cover the casserole (I covered mine with foil) and cook in the oven for 2½ hours. Remove the casserole and pour out the stock into a frying pan. Place the casserole back in the oven and cook uncovered for 20 minutes. In the mean time, heat up the stock in the frying pan and add the chopped green pepper and carrots until soft. Slice the lamb and serve with the vegetables. The meat is soft and falls apart as I tried to cut it. 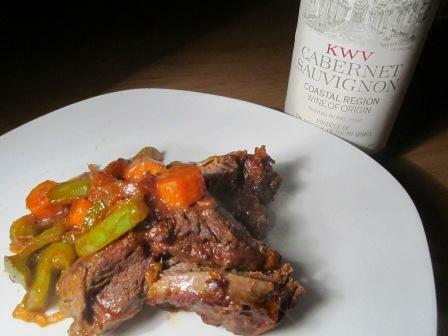 Was best enjoyed with a glass of 1988 KWV Cabernet Sauvignon. The Normandy region in France is the home of Camembert, cream, butter, apples and Calvados (apple brandy). 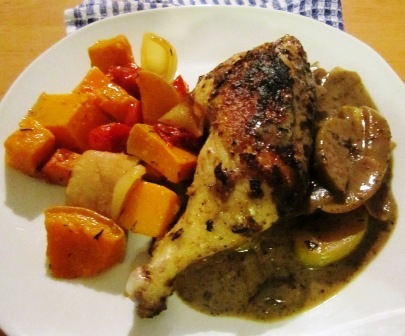 Normandy Chicken is an easy and delicious dish to prepare for autumn. Season the chicken with salt and let it rest for 30 minutes (It will help make the chicken skin become crispy when fried). 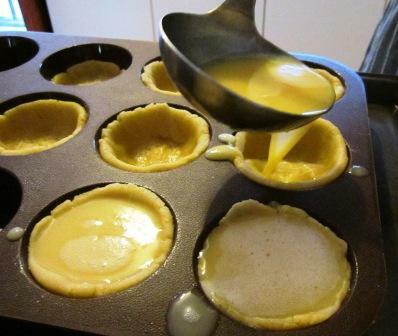 Melt 1 tablespoon of butter in an oven-proof sauce pan. Add the apple wedges and sauté until the apples become slightly brown. Remove the apples from the pan onto a paper towel, season with a small amount of salt. Add the onions and fry while deglazing the pan of any browned bits left over from the chicken pieces. Add the ¼ cup brandy and reduce for a couple of minutes before adding the cup of cider. Bring the onion, cider mixture to a boil. Season with thyme and a pinch of salt. Add the chicken pieces to the pan and place in the oven to cook for 30 minutes. After 30 minutes, take out the pan and remove the chicken. Place the pan back on the plate and add the apples. (I saw that there was quite a lot of juice in the pan, from the chicken. Reduce the sauce to half. When the sauce has reduced, add the ¼ cup yoghurt. Add salt to taste. Serve the apple and onions with a helping of the creamy sauce / gravy with the chicken on top. This is a delicious meal with a elegant apple flavour that doesn’t over dominate the dish. 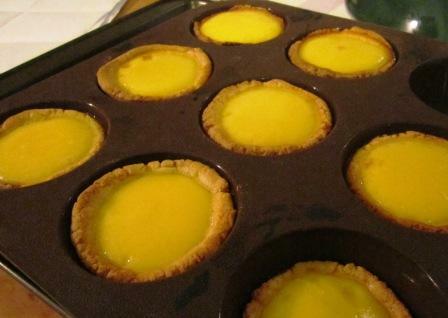 Since I’m not a very good baker, I found egg tarts to be a very easy Chinese dessert to make. 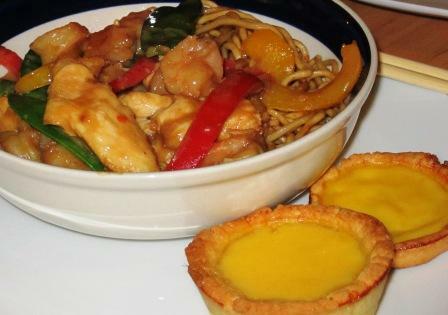 These golden coloured treats are ideal for Chinese New Year celebrations and a perfect mini dessert for the delicious Phoenix and Dragon stir fry that I have made. To make the cups, mix the flour and white sugar together. Break in the butter and mix it with the sugar and flour until the mixture becomes crumbly. Stir in the egg and the vanilla and form a dough. The dough should be slightly moist. 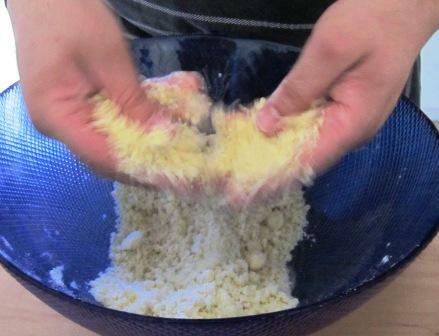 If it is too dry, mix in a bit of butter or if it is too moist, mix in a bit of flour. Shape the dough into small balls (I made 6 – 7 dough balls). Press a ball into a mold so that it covers the bottom and goes up the sides. Start heating up your oven to 230’C. Mix the sugar and water in a saucepan and boil until the sugar has been dissolved. Take the pan off the stove and allow the sugar water to cool down to room temperature. 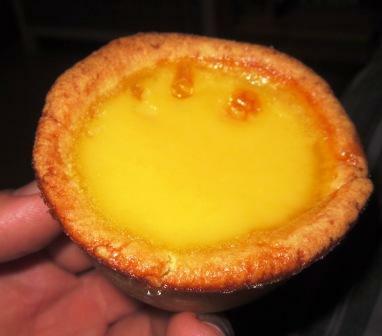 Fill the cups with the custard and bake the egg tarts for 20 – 25 minutes until they become slightly golden brown and the custard puffed a bit up. Who said that you can’t celebrate new year twice a year? 2012 is the Year of the Dragon and luck and fortune are the main themes. Red and gold colours also play an important part in the celebrations. During the New Year period (which can last several days) families will come together and wear red clothes, hand out red envelopes with money in it called “lucky money”. 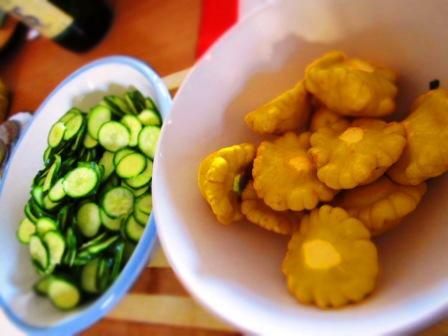 So to celebrate Chinese New Year, I have decided to make some Asian inspired dishes. I made Phoenix and Dragon stir fry which is a simple combination of chicken and prawns marinated in cornstarch, soy sauce and sherry stir fried with red and yellow peppers served on a bed of noodles (which symbolises long life). Mix 2 tablespoons of dry sherry with 2 teaspoons of cornstarch and a tablespoon soy sauce. Combine with the chicken and allow the mixture to marinade in the fridge 30 minutes. 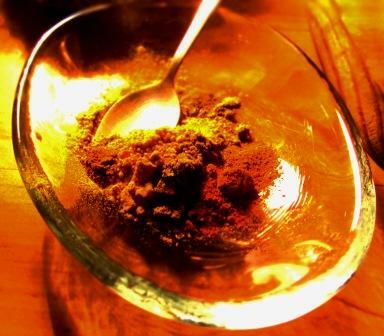 Mix 1 tablespoon dry sherry with 1 tablespoon cornstarch and 2 teaspoons soy sauce. Combine the prawns with the mixture and allow to marinade in the fridge for 30 minutes. Prepare a soy and peanut oil sauce by combining 2 tablespoons of sherry, 2 teaspoons of peanut oil, 2 tablespoons of soy sauce, 1 tablespoon of sugar and salt and pepper to taste. Heat up 2 tablespoons of vegetable oil in a large saucepan or wok. Fry the garlic and ginger until it become fragrant. Fry the chicken for a couple of minutes until the chicken isn’t pink any more. Add the prawns and fry together for another couple of minutes until the prawns become pink. Add the peppers and a hand full of mange tout and stir fry the mixture for a minute so that the vegetables are still crisp. Drizzle over the soy and peanut sauce over the dish and stir until all the flavours have combined. 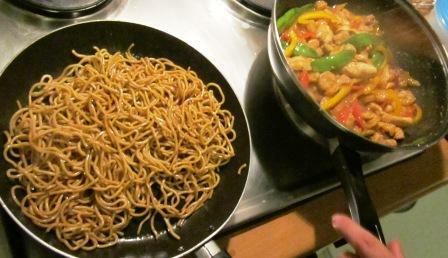 Serve on egg noodles that have been boiled and then pan fried in soy sauce. Decorate with origami Dragons! 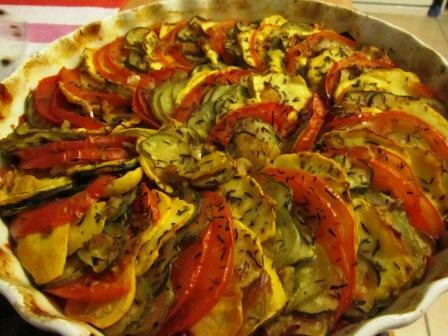 This version of ratatouille takes a little bit of effort and time to produce, but the results are beautiful as well as delicious. 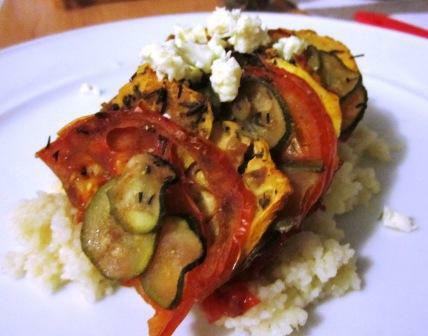 Similar to the dish prepared in the film Ratatouille. This is a two-part recipe as one of the main ingredients for confit byaldi is piperade (a slightly spicy tomato, onion and pepper sauce). Heat up the oil in a large sauce pan to medium. Fry the onions, garlic, peppers, salt, pepper, sugar and paprika for approximately ten minutes, stirring regularly. 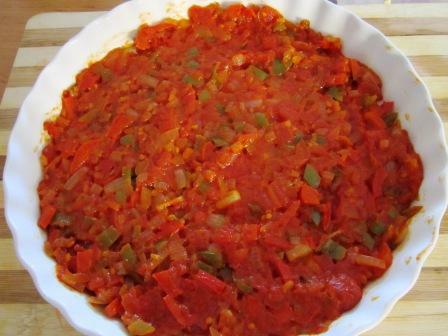 Add the chopped tomatoes and let the mixture simmer for 15 minutes until it has become a thick sauce. Heat the oven to 150°C and grease a medium-sized round baking dish. Line the base of the baking dish with the piperade and stack the vegetables on top of it, alternating between the ingredients; a row of baby marrow, row of pettypans, row of tomato etc. Sprinkle the garlic and thyme over the dish. Cover the dish with a layer of baking paper that is cut to fit inside the dish (mine was a bit fully stacked, so the baking paper just rested on top). 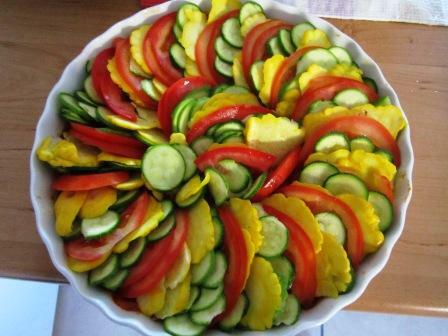 Bake the ratatouille for 1h45min. Remove the baking paper and continue to bake the dish for an additional 25min. 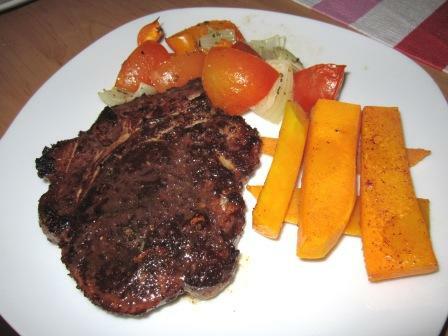 Drizzle 2 tablespoons of balsamic vinegar over the dish and season with salt and pepper. Serve on couscous, rice, as a side dish or on its own. 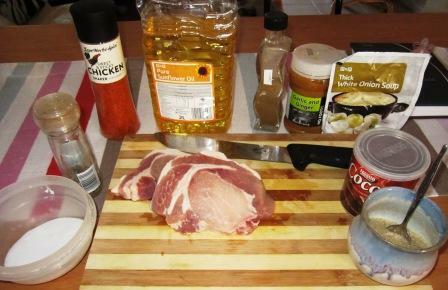 Here is an interesting spin on the standard pork chop recipe that I has stumbled upon. Pork was always a boring dish to prepare which I always just spiced with salt and pepper. Now “boring” meal has been pepped up with the subtle chocolate and chilli flavours. Heat the vegetable oil in a large frying pan. 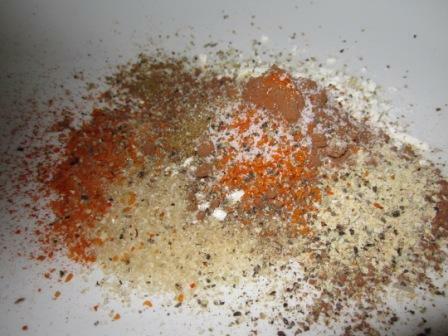 Mix all the dry ingredients together and rub generously over the pork chops. Fry the meat for 5 minutes per side or until the meat is not pink any more. Serve with roasted vegetables and butternut squash chips. Pair with a fruity Cabernet/Shiraz blend.